We are currently building a brand new river cruise booking engine. Meantime, Uniworld cruises can still be booked offline through our sales team. Contact us. 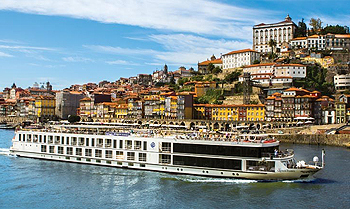 Uniworlds Queen Isabel provides an up-close and unforgettable view of Portugals Douro River Valleya designated UNESCO World Heritage Siterenowned for its dramatic, rugged scenery and pristine waters. Named after Portugal’s beloved queen, this boutique 118-passenger vessel is the most unique and stately ship on the Douro, a wonderful place to admire the regions steeply terraced hillside vineyards and charming wine estates.